What truly differentiates DeLauter is our unparalleled commitment to client service, including our advanced level of pre-construction services which help identify key success factors early in the process, helping make the delivery of our clients’ office / medical spaces more efficient. Our specialized project team focuses on exceeding our clients expectations at every level. Because we handle your entire medical project from conception to final inspection, you’ll have the advantage of a turnkey operation. 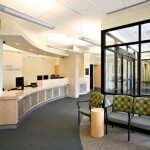 including exam rooms, admin areas and waiting room so that you can use the space as wisely as possible.